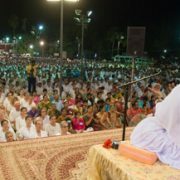 After 3 weeks of slowly moving north, with the Mumbai programs finished, Amma and the tour group turned back and headed south. 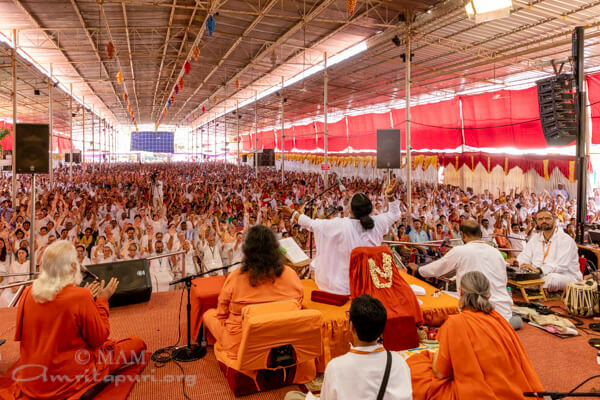 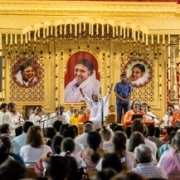 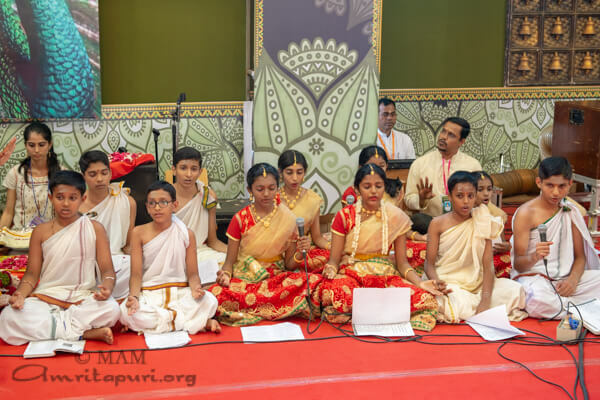 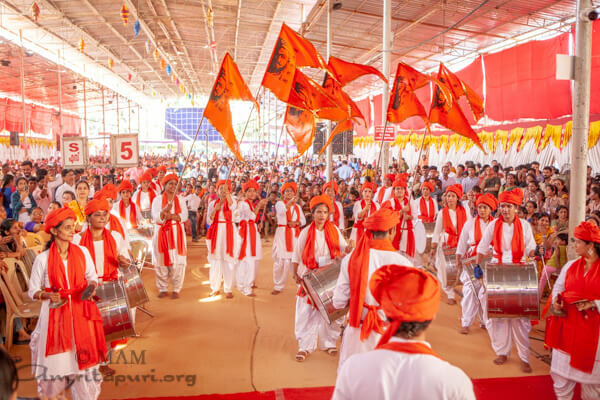 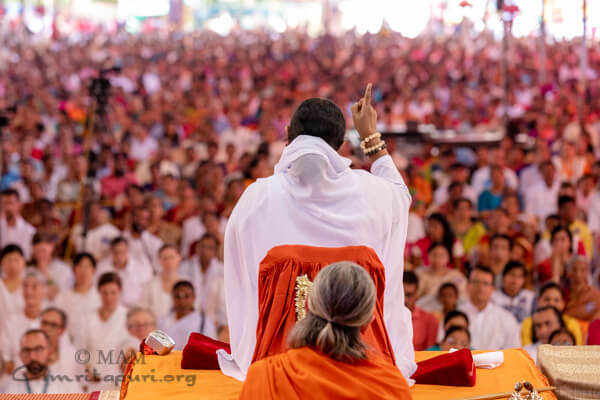 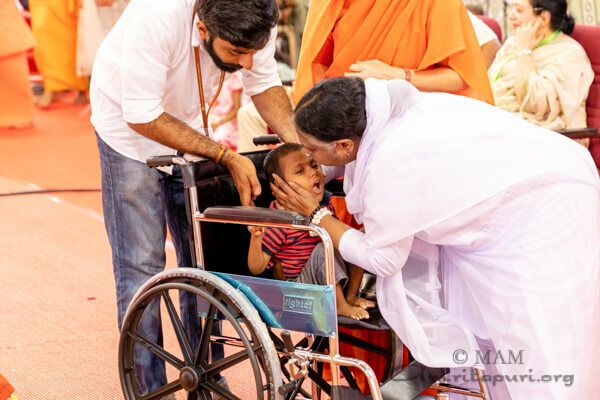 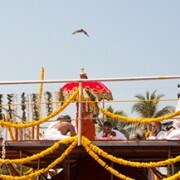 After driving 950km, over more than 24 hours, through the length of Maharashtra and Karnataka, the group arrived in Mangaluru for two day Brahmasthanam festival. 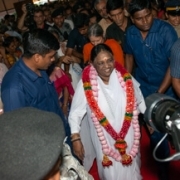 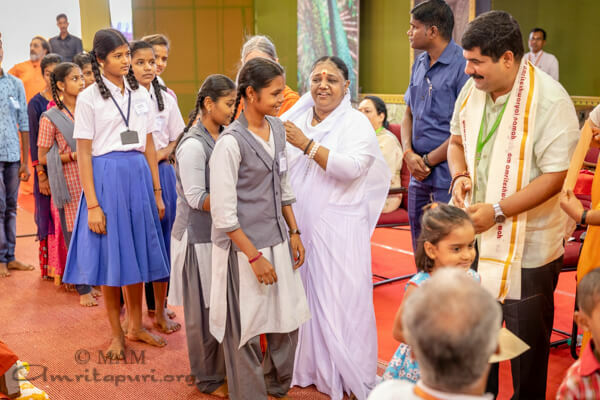 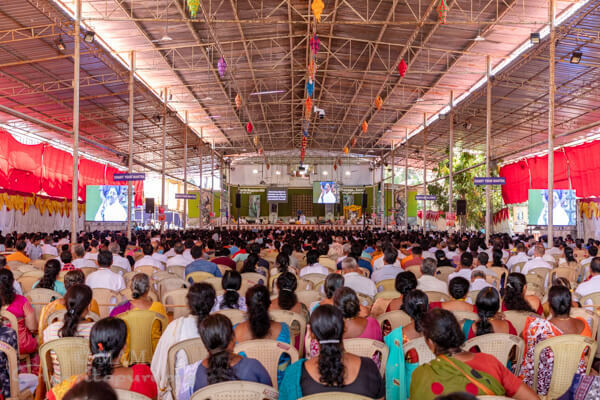 When the programs started, Amma was welcomed to the stage by students of the local Amrita Vidyalayam with Vedic chants. 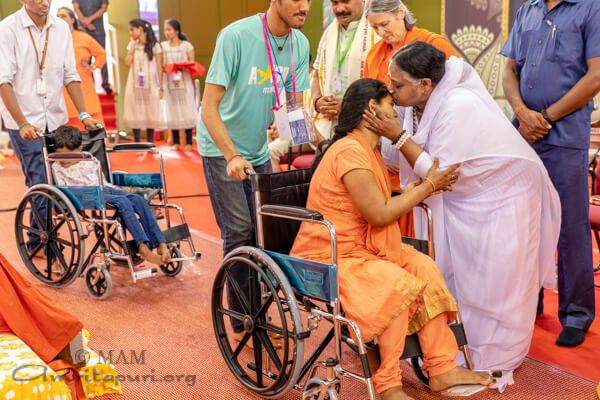 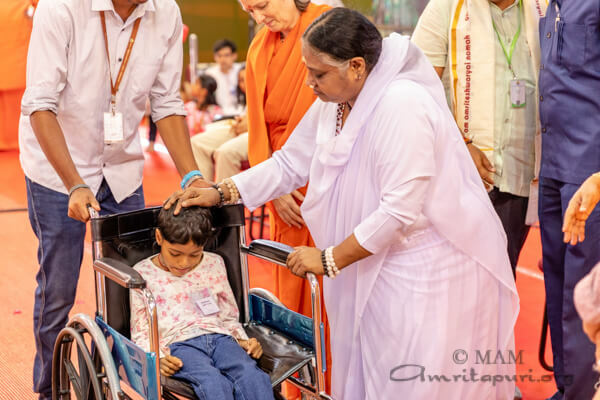 During the stage program, Amma distributed saris to women of the Amritasri self-help groups, 10 wheel chairs to Divyang members, and scholarships to support the education of 20 local students. 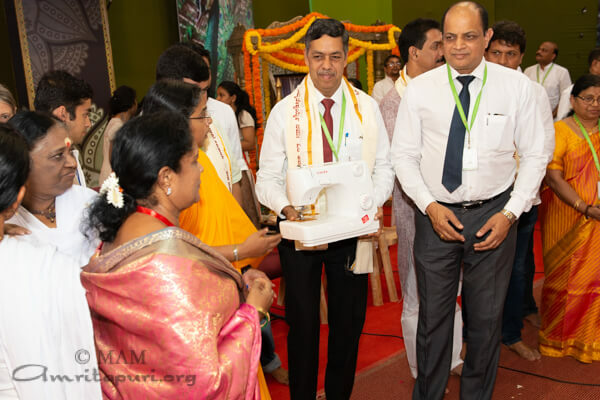 Additionally 5 sewing machines were given away to local women to help them maintain their livelihood. 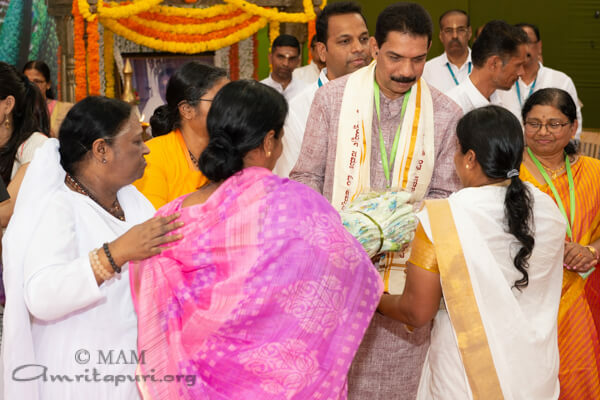 Amma was also welcomed by Harish Kumar, MLC, Karnataka Assembly. 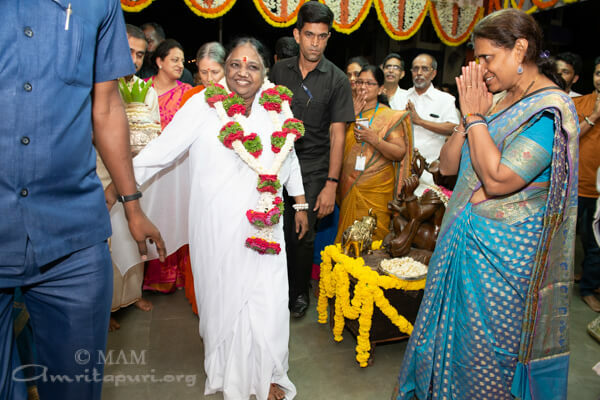 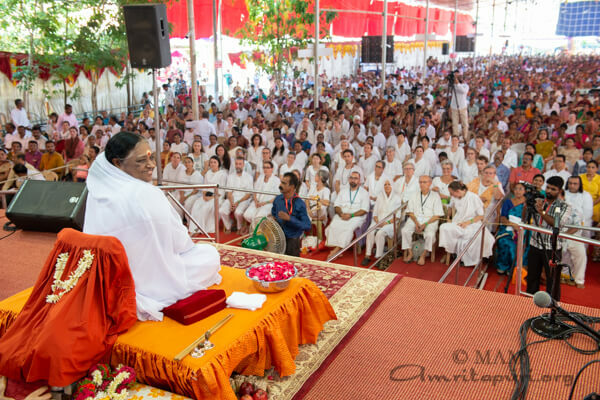 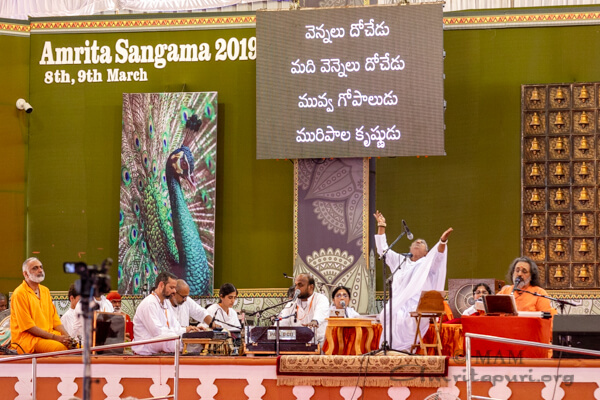 On both days Amma sang bhajans, gave satsang and darshan to everyone. 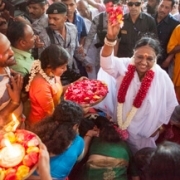 She also lead all in meditation and manasa puja, giving the instructions in the local Kannada language. 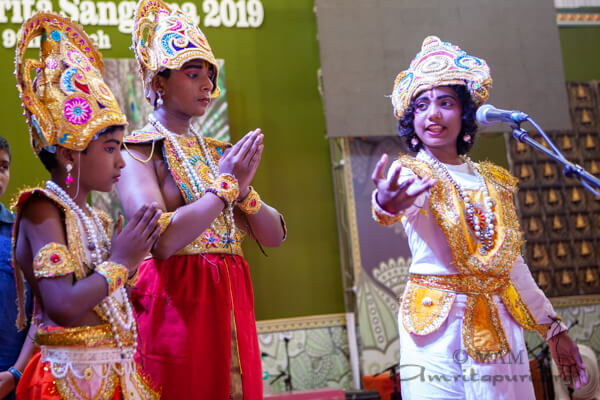 On both days, local Amrita Vidyalayam children presented different cultural programs on stage while Amma gave darshan. 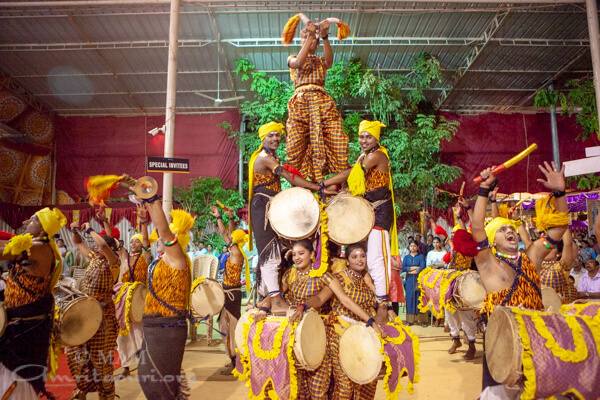 Also several electrifying dance and percussion performances captivated the audience each evening; first with a ‘Dollu Kunita’ folk dance of North Karnataka was offered to Amma by the devotees. 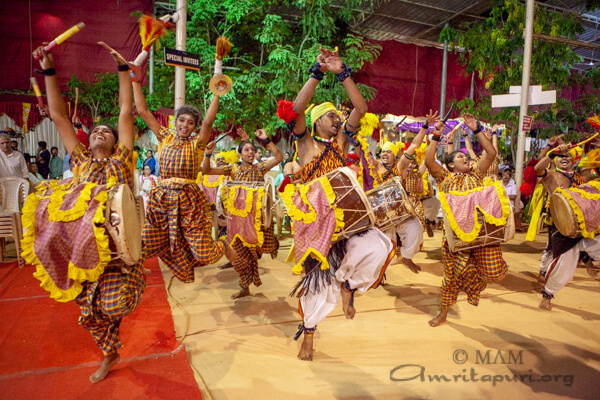 On the second night ‘Nagpur Dol’ which was performed by teachers of Amrita Vidyalayam. 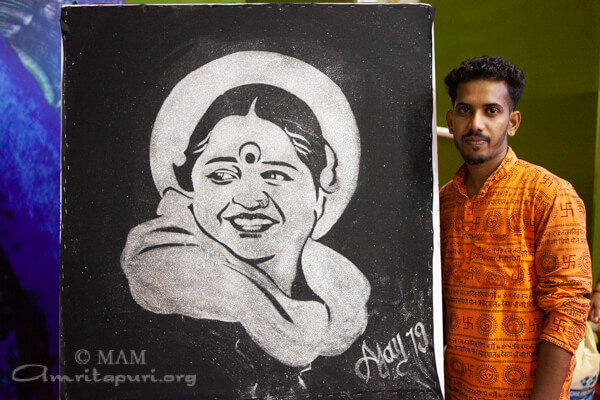 A local artist, Ajay, offered a very unique and creative way to express his devotion to Amma. 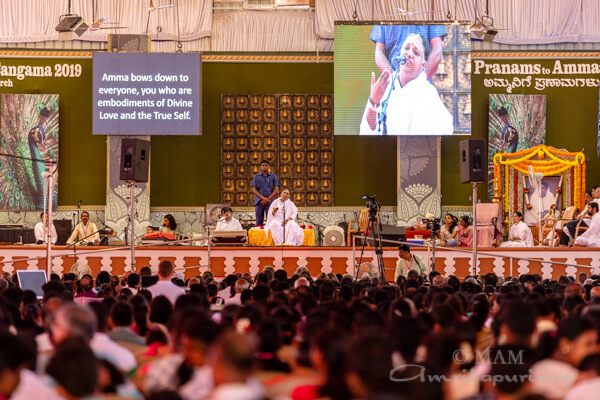 Live on stage he created a ‘glue painting’ in just a few minutes and delighted everyone as Amma’s image magically appeared once he applied glitter to the glue. 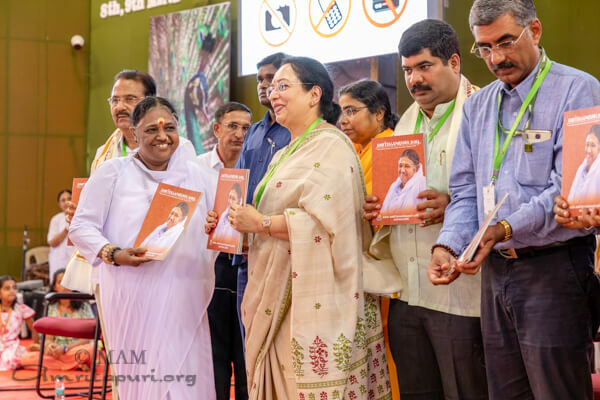 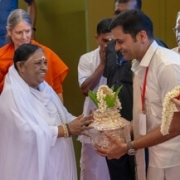 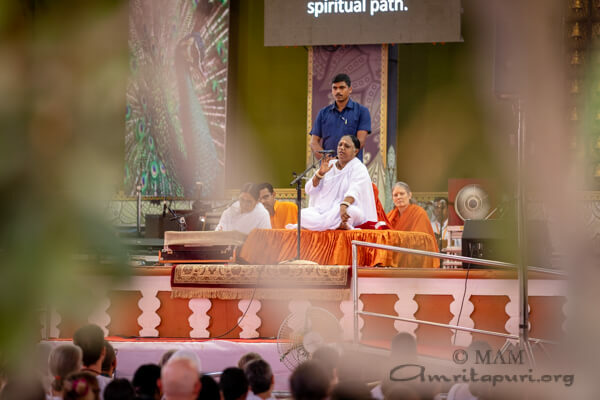 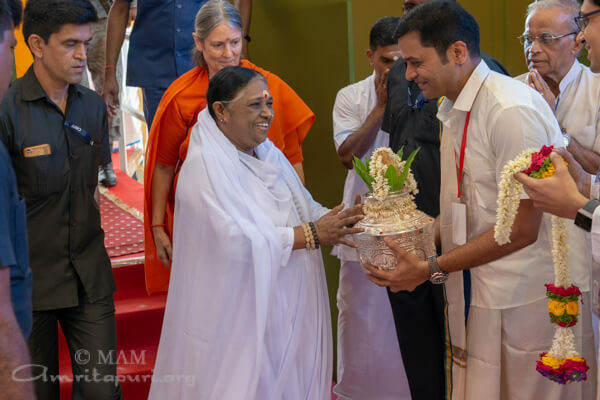 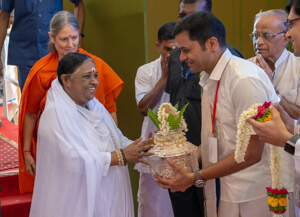 Amma finished the second night’s darshan in the early hours of the morning and shortly after the group returned back to Kerala for the last three stops of the Bharata Yatra.